My cellphone is an old LG Trax clamshell. It’s a dinosaur and has been extinct for several years now lucky for me it still works. I don’t know how to take pictures with it, it doesn’t tell me the weather or connect to the Internet.There’s no GPS on it. That’s the way I like it. In a world that has grown increasingly complex, I sometimes feel like a throwback to a different era. I struggle daily to keep things as simple as possible. As a research systems control facilitator at IBM in my former life, I used to deal with complex problems… and solutions… day in, day out. That’s when I started to understand just how damaging too much complexity can be — no matter where it pops up. Nowhere is this problem more obvious than with our animals. For example, our fast paced, highly technological culture presents a huge problem for your dog, cat and horse and is a source of much confusion, harm and even benign neglect. We’re simply not consciously aware or fully present with them as much as they need us to be. And when we’re not paying attention? They get into all kinds of trouble, and we do too. 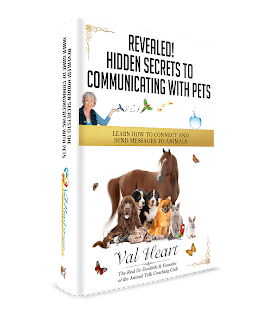 I hope you enjoy my new article on the First Step to Resolving Behavior Problems With Your Dog, Cat or Horse. This is actually the first of 3 Secrets I taught in the Free Call last Thursday, along with a very important surprise bonus technique at the end for accessing your bodymind wisdom and making heart based decisions. I don’t have a new podcast interview for you this week, but will for next week, I promise. And since it’s 9/11, I felt it important to celebrate a very special doggie hero named Daisy. I know her story will touch your heart as she did mine.